NOTE: This is a new address and most GPS systems do not correctly show this address as of 2016. Please use Google or Apple maps for directions or use the directions below. Take Willard Avenue in Newington to Alumni Road (behind Total Vision). From the North, turn right onto Alumni Road. From the South, turn left onto Alumni Road. Then turn right into our entrance driveway and proceed about 1000 yards to our entrance. 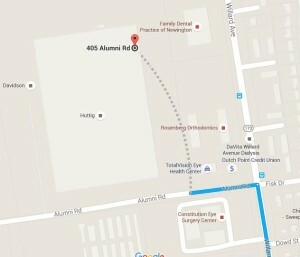 Note: You must enter Alumni Road from Willard Avenue as there is no access from Alumni Road from behind the Veterans’ Hospital.